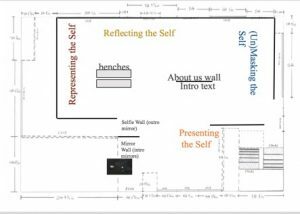 This Bryn Mawr 360 course cluster lets me step into the world of self-exploration through the theme of mirrors and masks. 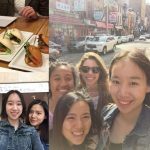 I started from reflecting back on my identity as a Chinese international student in a women’s college and began to learn to work as a group to tuckle new problems. 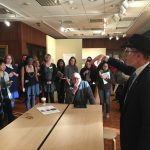 We had artists, art critics and donors came to visit our class. We also traveled outside the classroom to the national portrait gallery and the Barnes Foundation. The excellent team work led us to the successful opening of the exhibition. Uncountable drafts and meetings prepared us for the real world challenges. Prof. Robbins once reminded me that “curators are problem-solvers”. 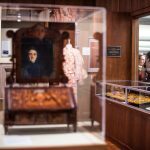 Through this year’s attempt of finding the ambigous self, I want this digital exhibition to tell a story of how I explored the self through my encounters with the objects and museum visits and what I gained from the experience working as a member of the group to make decisions for the exhibition. I used to think that being a curator is to tell a single story of objects and the goal of the spectators is to figure out this narrative in the exhibition. 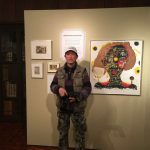 However, when I actually thought about the exhibition from the curator’s point of view, I found myself facing a challenge of making choices among tons of narratives. 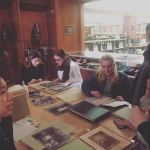 Besides doing research and making curatorial decisions, part of the course asked us to document our experience through social media. My instagram account became my new practicing field of self-reflection and how I make new meanings through comparisions. Posting on social media is telling a story of the self through images and short texts. Part of which showcased my activities as a college student. More importantly, the absence of my body in several posts holds a level of ambiguity about my personality. One of the most rewarding experiences for me was handling the objects in person. 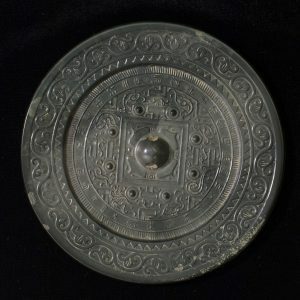 I researched a Chinese bronze mirror in the special collection and never thought about I would see my reflection in the mirror. As a curator, I have this opportunity to go behind the scene to have a personal encounter with the objects. It shortens the distance between me and these objects. Therefore, I can share these stories with my audiences, rather than just pouring out hostorical facts. 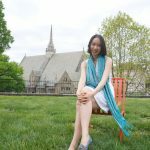 I was intrigue by the connection of Bryn Mawr alumnae and East Asian cultures. 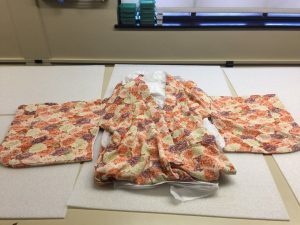 This Kimono in the special collections belongs to Bryn Mawr Alumnae Elizabeth Grey Vining, the tutor of the former Japanese Emporer. How this object relates to our theme beyond self-fashioning? I struggled with the question until finally realized that wearing these cultural clothes is a masquerading of a certain cultural identity. The mask also includes the body, as the scholar of African Masks Z. S. Strother acknowledged. 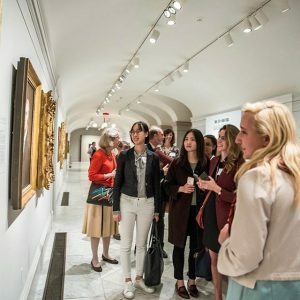 This issue of masquerading in a traditional attire as cultural appropriation led me to the controversial event took place at the Museum of Fine Arts in Boston.In the summer of 2015, MFA launched an event titled “Flirting With the Exotic”. 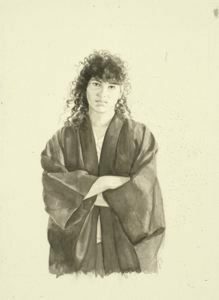 I related this controvercy back to a painting of a non-Japanese woman in a kimono by Deborah Deichler to discuss this topic in relatio to our exhibition. 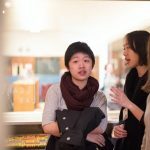 Outside of the Classroom: Meet new faces! Class Field Trip at the National Portrat Gallery. October 2016. 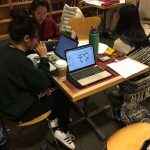 Photo by Bryn Mawr College. Jessica Todd Harper, “Becky, June, Jessica and Mary”, 2013, On view at the National Portrait Gallery during the class visit. During the luncheon at the National Portrait Gallery, I discussed the problem of museum education with several Bryn Mawr alumnae. They were really patient with my questions about internships and concerns with future careers. 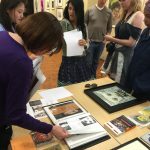 What I saw from these women was their passion for the museum and art that kept them in pursuing this field. 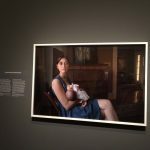 One of the prize-winning portraits by Jessica Todd Harper was also on viewed at the National Portrait Gallery. Jessica later came to visit our class and shared her story of learning to be an artist at Bryn Mawr. 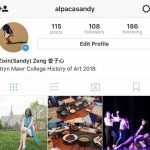 Bryn Mawr College doesn’t offer art courses and art students need to travel to Haverford College. This might be an internal drawback of our research and curatorial decisions. What does it feel to make these portraits? This might be a future exploration for me in the topic of self and self-reflection. Thanks to these interactions with alumnae, scholars and artists from the different disciplines, I became more confident not only as a public speaker. but also a future curator who has the passion to connect the community with the art world. 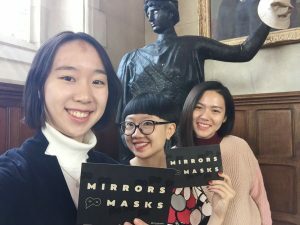 Thanks to the various backgrounds of our curators, I got to read interesting researches of mirrors and masks from different cultures through different perspectives. We worked as groups to present curatorial ideas and committee works. 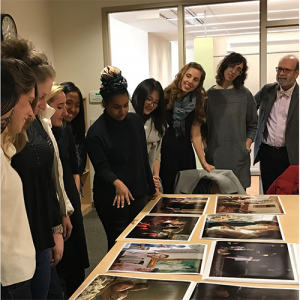 The power of the group work truly paid off as our discussion on the multiplicity of the self broaden my understanding of the artworks beyond my cultural identity. 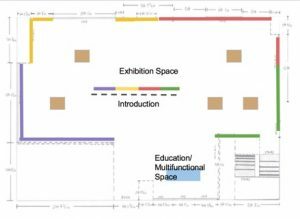 Our initial floor plans of the exhibition separated the space into smaller sections according to their functions and themes. We created lots of walls in order to insert more pictures. 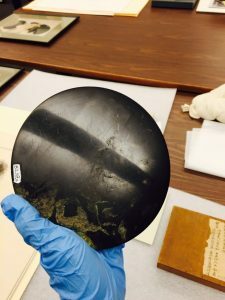 Another issue we were concerned about is the wide-range of time and culture of our collections. How to provide more connections in the space. and how can we avoid the mistakes of appropriating certain cultures? Less is more. This short sentence concludes what I learned from this process after we rejected to put up more walls to squeeze more objects into our exhibition. Looking back to the exhibition from a visitor’s point of view, the exhibition changed into a more friendly and open design with a managable number of objects from our rich collections. Exhibition floor plans presented by the two groups. We can already see some similarities in the placement of objects and walls. All the objects are grouped into a certain theme, but we tried to open up the space for potential connections across sections. 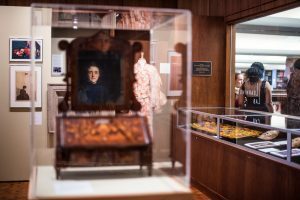 The final floor plan featured a trio of M Carey Thomas’s Portrait, her mirror case and Miram Shapiro’s painting at the entrance. 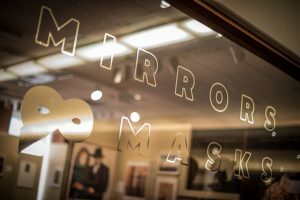 This highlights the collection and the title “mirrors and masks” and helps us to navigate through the four themes at the same time. Xiaoya, Zichu, Abi and I were members of the event committee. 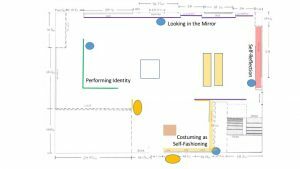 We planned the opening masquerade, promoted artists lecture seires and sent press-release to universities and local communities. 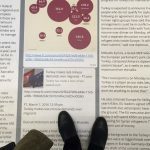 The big difficulty for us was how learn from this real-world practices as a part of our exhibition. Because the limit of our ability and time, we ended up cutting off many of our activities. This practice really got me involved with the community as they participated in our events. Different opinions and critics brought by outside scholars and critics also reminded me of the exciting exhibitions going on around us. As a final take-away of the course, I am grateful that this experience allows me to understand my self as an ambiguious subject. I have the potentional to connect to the world of art through this exploration of identities. I am ready to meet more people in the art field and have a deeper discussion. 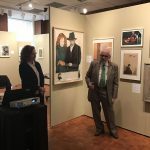 Special thanks to the Bryn Mawr 360 Program, Prof. Steven Z. Levine, Prof. Carrie Robbins, our teaching assistant Laurel McLaughlin, my fellow curators, and all the faculties, alumnae and staff who have contributed to our class experience and supported the exhibition. 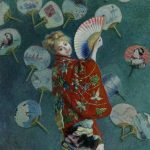 Erin Kelley [Schoneveld], “Envisioning the ‘New Woman’: Seito Magazine and Feminist Aesthetics in Modern Japan,” Modern Art Asia 8 (November, 2011). Strother, Z. S. “Invention and Reinvention in the Traditional Arts.” African Arts 28, no. 2 (1995): 24-90. doi:10.2307/3337223. 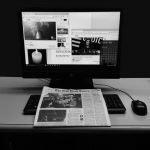 is a current junior History of Art Major and Economics Minor at Bryn Mawr College. 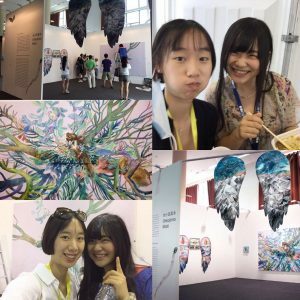 She is from Beijing, China and is interested in contemporary art market. 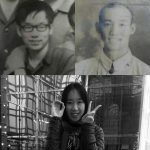 This summer 2016, she took an internship at ART NOVA 100 in Beijing working as an assitant curator with young artists (artists born after 1980) from China, Korea and Japan (Check http://www.artnova100.com/enindex.aspx for more information about ART NOVA 100). She is looking forward to work with artists in the future and to explore the dynamic world of contemporary art.